Scientists use the term xenoestrogens to describe foreign chemicals which act like estrogen in animal tissues. There has already been much ado in the media about BPA (bisphenol A), a different potent xenoestrogen found leaching from polycarbonate plasticwhich is used in many sports bottles and baby bottles. Now widespread in human tissues, BPA has been linked in hundreds of studies to a host of health problems including obesity, diabetes, breast and prostate cancer, infertility and attention deficit disorder. But water, sodas and sports drinks are all sold in bottles made of PET or polyethylene terephthalate which does not contain BPA, so accumulating evidence that the contents of PET bottles can exhibit estrogenic activity has come as a surprise. In a review of this topic published in the journal Environmental Health Perspectives in 2009, the executive director of the Pennsylvania-based Center for Research in Child and Adolescent Development, Leonard Sax, detailed the evidence that PET plastic is indeed a source of phthalate and antimony contaminants in beverages, a conclusion contested by the PET Resin Association which represents the makers of PET in North America. Some of Sax’s key arguments are summarized below. 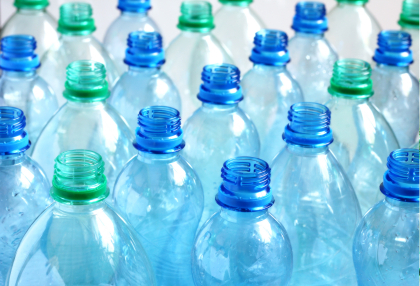 Multiple laboratories have shown that water samples from PET bottles can test positive for estrogenic activity by using an accepted yeast assay method. However, direct evidence that an estrogen mimic not already present in the water prior to bottling is released from the PET was demonstrated in 2009 by German scientists who first emptied several brands of mineral water sold in both PET and glass bottles and then replaced the water with mud snails in a growth medium to determine if the type of bottle would affect the snails’ reproduction. Mud snails were selected for study because they are highly sensitive to estrogen. That mud snails incubated in the PET bottles produced significantly more embryos than snails in glass bottles, no matter what bottle brands were tested, pointed to an estrogenic substance emanating from the PET. Phthalates are softening agents added to some plastics to make them pliable. A growing literature links phthalate exposure to abnormal development of the reproductive system and to obesity, triggering recent legislative and governmental actions to limit phthalates in consumer products in the United States, Canada, Australia and European Union. In an investigation of 71 commercial brands of water, all sold in both PET and glass bottles, the level of phthalates was nearly 20 times higher in the PET bottles, according to a 2008 report in the journal Food Additives and Contaminants. That phthalates are introduced into the water from the PET bottles seems pretty clear given other studies showing gradually increasing levels of phthalates in water stored over weeks or months in PET, but not glass, containers. Warmer storage temperatures and acidity, as in soda pop, seem to promote greater leaching of phthalates. However, the PET industry asserts that phthalates are not used in the production of PET drink bottles, so how it gets there is somewhat of a mystery. Sax posits that recycled PET could be the source of phthalates in beverage bottles. The U.S. recycling rate for all PET containers in 2009 was 28 percent. Other products bottled in PET, like some shampoos and cosmetics, are purposely formulated to contain phthalates which could have migrated into the PET before recycling. Antimony is a heavy metal commonly used as a catalyst in the production of PET resin. The U.S. government has set limits for acceptable levels of antimony contamination in drinking water based on older findings about its cardiovascular risks and carcinogenicity. But, only since a 2003 study from South Korean researchers has it been known that antimony also has potent estrogenic properties not mentioned on the U.S. Environmental Protection Agency’s website on antimony in drinking water. Researchers from several different laboratories have now detected antimony in many brands of bottled water, and upon exposure to warmer storage temperatures the levels rise and can reach or exceed the U.S. government’s safety limit. Sax does not rule out that other unidentified xenoestrogens in the bottle wall, in addition to phthalates and antimony, might also contribute to the estrogenic activity of water bottled in PET. Why Avoid PET Bottle Beverages? Many brands of bottled water, including Dasani and Aquafina, are just reprocessed tap water sold at a thousand times the cost. The yearly price tag of drinkingt two liters per day of tap water is ~50 cents. Tap water undergoes mandatory daily testing; reporting of contaminants in bottled waster is not required. As a petroleum derivative, PET bottles contribute to oil spills and pollution of air & groundwater in communities near refineries. 17 million barrels of oil are used to manufacture bottled water each year. PET bottles are non-biodegradable, probably lasting hundreds of years in landfills. An ocean area double the size of Texas dubbed the “Great Pacific Garbage Patch” already contains a plastic soup with 46 times more plastic debris than plankton. However, if none of these reasons suffices to move you, perhaps protecting your family and self from potentially risky chemicals leaching from PET bottles will. This entry was posted on Thursday, December 16th, 2010 at 8:42 am and is filed under plastics, sustainable living. You can follow any responses to this entry through the RSS 2.0 feed. You can leave a response, or trackback from your own site. I have long suspected that single-serving plastic water bottles were contaminated with something I would, in the normal course of things, probably want to avoid. I consider myself an environmentalist, but I really did not deserve that title until I gave up my occasional nasty plastic bottle habit about a year ago. Thanks, Sarah, for doing the research that fortifies my decision. I was focusing on how bad plastic bottles are for the environment at large. Now I have another well-founded reason to celebrate kicking the plastic bottle habit. Along with trashing what remains of the ecosystem, we do not respect our own personal, internal “environments” by plastic bottle guzzling.